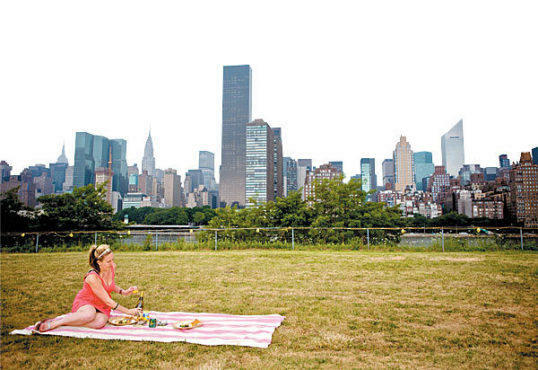 Dust off your baskets, folks: TONY recommends the city's top picnic spots for every occasion-and what to eat when you get there. Midpark; enter at 72nd St. The cove is located down a stone staircase off of Cherry Hill. This tranquil, tree-shaded lagoon, on the banks of the Central Park Lake, offers plenty of seating options, each with its own charm. Find romance in a small shed once used as a rowboat drop-off; perch on a tree trunk that grows horizontally over the water; or recline on a gently-sloping patch of grass. 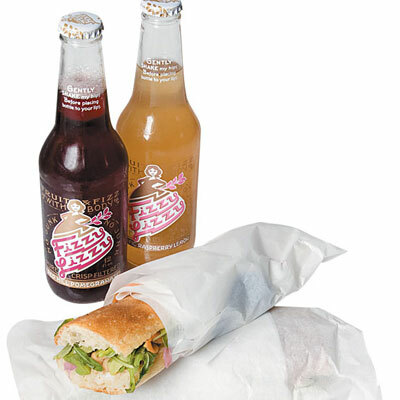 If you’re entering the park from the west, stop at Grandaisy Bakery (176 W 72nd St at Broadway, 212-334-9435) to pick up sandwiches, like the vegan panino Greco (skordalia, arugula, pickled onions and thyme-flavored chickpeas), and cool bottles of Fizzy Lizzy, packed into picnic-friendly gable boxes. If you’re coming from the east, visit Grace’s Marketplace (1237 Third Ave at 71st St, 212-737-0600) to score almond-stuffed olives, Turkish figs and more. Take the Roosevelt Island Tramway from 59th St or take the F train to Roosevelt Island. Walk south along the river walk to Southpoint Park. You won’t have to jockey for blanket space on the expansive land that curves around the southern tip of Roosevelt Island. Bring a crew (and a Frisbee) and take in the stunning vistas: Behind you, the Renwick Ruins—the remnants of a 19th-century hospital—and to the west, a view of the midtown skyline. Stock up on fromage before boarding the 59th Street tram at Ideal Cheese Shop (942 First Ave between 51st and 52nd Sts, 212-688-7579). Opt for varieties that won’t melt in the sun, like the firm Marcel Petite two-year Comté, and fill out your meal with oil-cured Spanish tuna, Fra’Mani sausage, Balthazar baguettes and carbonated peach nectar for on-the-go Bellinis (just add white wine—and brown-bag it). There’s also an on-island option: Subs can be procured at Nonno’s Focacceria (455 Main St, 212-753-2300), or order a pizza—they will deliver it to the park. Though there are limited options for public grilling in NYC, Prospect Park boasts a whopping seven designated spots. Stake out a public grill on the knoll that surrounds the park’s bandshell (especially desirable during shows—a 16-piece orchestra plays with three Charlie Chaplin films on Friday 1). First, swing by 25-year-old United Meat Market (219 Prospect Park West at 16th St, Windsor Terrace, Brooklyn; 718-768-7227). The old-school butcher offers coal-ready meats like sausage pinwheels, chimichurri-marinated steaks and ground-chuck burgers, along with buns and breads from Carroll Gardens’ Caputo’s Bakery. 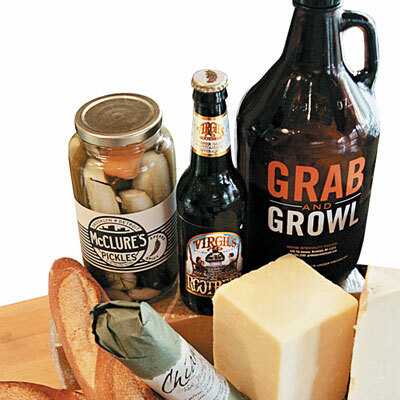 Sharp cheddar will melt beautifully on that burger—pick up a wedge, along with garlicky McClure’s pickles and growlers of Sixpoint beers from gourmet shop Grab Specialty Foods (438 Seventh Ave between 14th and 15th Sts, Park Slope, Brooklyn; 718-369-7595). This 25-year-old neighborhood garden offers solitude in the bustling East Village. The flora-filled space features large picnic tables shaded by willows, poplars, creeping grapevines and rosebushes. To this lush refuge, bring poppy-seed-speckled rolls and thinly sliced smoked ham from the Eastern European East Village Meat Market (139 Second Ave between St. Marks Pl and E 9th St, 212-228-5590). 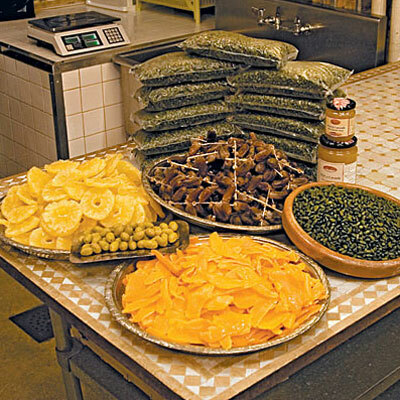 Just down the block from the garden is mushroom mecca Truffette (104 Ave B between 6th and 7th Sts, 212-505-5813), where international delights line the shelves: Indulge in Jordanian dates, salty Sicilian pistachios and Picholine olives. Join hundreds of open-air diners at weekly outings organized by the Picnic Club. Visit thepicnicclubnyc.blogspot.com for more information. Like picnics? 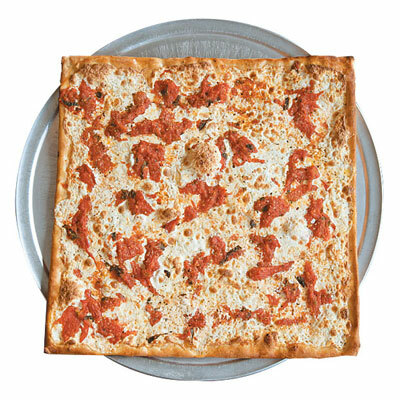 Send photos of yourself at all four al fresco spots to eatout@timeoutny.com by August 14. TONY will deliver a basket of choice picnic-worthy goods to the winner.